2. What is the speedtest-cli application? 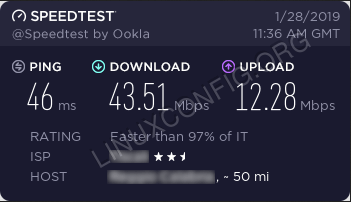 Running a speed test can be very useful to verify the current state of an internet connection, for example, to verify that our ISP (Internet Service Provider) is respecting the parameters we are paying for, or to diagnose possible problems. One of the most common ways to check ping, download and upload values is to run a test from the speedtest.net website. The speedtest-cli program let us run the same test from our beloved command line interface. What is the speedtest-cli application? Written in python, the speedtest-cli utility, is basically the command line interface equivalent of running a speed test from the speedtest.net website. The utility is completely open source, released under the Apache 2.0 license. It can be really useful to check the efficiency of an internet connection when working in a command line environment, or when scripting. In this tutorial we will see how to use it and what are the most interesting options we can use to modify its behavior. As you can see, by default the speed is expressed in bits. To use bytes, instead, we can use the --bytes option. We saw the basic usage of the command, now let's see how we can customize its behavior with the possible options. The results can also be represented by using the json format. The --json option can be used to obtain this behavior. In this tutorial we saw how to install and use the speedtest-cli application. The program is basically the command line interface equivalent of running a speed test on the https://www.speedtest.net site, and can be very useful when operating on a machine without a graphical server installed. We saw how it's possible to obtain results in various formats like json or csv and how to automatically share them. We also saw how to generate the list of all available servers used as endpoints, and how to manually pick one instead of using the automatic detection of the closest.